When I bought my first home back in 1973, Australians were being advised not to pay more than 25% of their net income on their mortgage. It was sound advice and one, even the banks used, to calculate whether the mortgagee would be able to meet the quarterly repayments. As a further rear guard action, banks would only loan up to 75% of the property valuation. Back then, your local bank manager actually cared about your future ability to meet your commitments when interest rates were similar to today’s rates, at around 6%. But that is where any similarities, between then and now, end. Today, homebuyers are paying an average 30% of their mortgage. It is symbolic of changing attitudes that work in favour of the banks, mortgage brokers and property developers. But not the mortgagee. Many mortgagees are paying over 50% of their net income on their repayments. Today, they are clinging precariously to a tightrope, swaying in the wind. With wages stubbornly static and prices creeping up by stealth, the broader Australian mortgage belt is showing signs of stress. The Household Financial Comfort survey of 1500 households in June, conducted by ME Bank shows that the average Australian is now eating into their savings to meet their weekly commitments. This is a matter of serious concern for the nation as a whole and especially for the Reserve Bank. It is household debt, not national debt, that has the capacity to bring our nation’s economy to its knees. The report tells us that 10% of households are now spending more than they earn. That means they are either digging in to their savings and/or further increasing household debt (borrowing more). So, here we are, listening to all this rubbish about jobs and growth, balancing the budget, a future return to surplus and other such meaningless policy directives, while ignoring the one issue that has the potential to undermine the entire economy, literally overnight. We all saw how quickly the collapse of Lehman Bros set a cat among the pigeons on Wall Street in 2008. We have seen here in Australia how, despite the recent levels of jobs growth, unemployment and underemployment have not moved to any greater or lesser degree. Our economy has been growing over the past two years on the back of immigration and deficit spending, not balanced budgeting or surpluses. We are now a country of 25 million, up 2 million since 2013. It is that increase that has kept us in growth nationally. The Household Financial Comfort survey is now telling us that our national growth is masking a serious problem, that of over-extended household debt, a debt that is becoming increasingly harder to manage. Reserve Bank Governor, Philip Lowe has expressed his concern about the slow pace of wage growth and its impact on economic activity. Is the government listening? It would appear not. Their approach is to give tax cuts to big business while ignoring rising household debt. What happens when the savings run out and credit cards have reached their limits? That day isn’t far away. It will require a massive injection of government spending to avoid a catastrophic collapse, one that would have a far more significant impact on the Australian economy than that of the GFC. It’s one of those hidden dangers that only rears its head when it’s too late. The government is under the illusion that all will be well if we lower the tax rate for big business, because it will create more jobs. What hogwash! Where are the economists’ warnings? Who is advising this compromised government indebted to its masters at the IPA and ignoring CEO pay binges? Who is warning of an impending mortgage meltdown? For all those frogs in the saucepan, the temperature is rising. Also back in the 70s, interest rates were much higher than today and buying a house was comparatively as much a struggle as it is today. All new buyers seem to consider is the cheaper cost decades ago but they were also rising quickly back then too. One major difference I have noticed is that now there are far more ways to spend money, more financial distractions and greater competitive social pressures. There was no internet or mobile phones to soak up more and more of your disposable income. Also, there was a market to build cheap first homes – basic modest hardiplank dwellings. With the rising cost of developing land, builders now offer large brick veneer houses with double garages and carpetting included and buyers feel they “want it all and they want it now” rather than working their way up through the market. The sad thing is the media whipped up a buying frenzy to scare people into the market to sell newspapers and will sell even more as it all comes apart when interest rates rise and blame the careless greedy borrowers. When we bought our first house, I looked for the charm and the location, I had all the time to make the improvements to create my dream house ..but NOT a luxurious place, just a cosy and homely abode with a luscious garden…. I don’t understand why a PROFESSIONAL couple can’t afford to buy a house today…. The IPA should be rebadged as the IGA. The Institute for Gina’s Affairs. No Ross … The IMA … “Institute for Murdoch Affairs” is historically more accurate. And (young) Rupert continues to seek his (late) father’s approval by pursuing Sir Keith’s dream of closing the ABC because it has better news coverage and is held in higher regard among the Australian people than any of the News Ltd mastheads. @Zathras: In our district in the 1970s you built your own home and paid under $100 per square metre (>$100/m2). Even more surprising, is that to get a bond loan from the Victorian Dept of Housing, the rent has to be less than 55% of your income. So our lowest paid can pay up to 55% of their miserable income on rent and not be considered disadvantaged. Mind you, if they pay less than 55% of their income on rent they’re unlikely to end up with a roof over their head at all. My parents started out their marriage, almost 55 years ago, living in someone’s garage, with donated furniture, and were perfectly happy. 31 years ago I started out in a small duplex with donated furniture and was happy to have a roof over my head. Surely this generation could see their way to being happy starting out with the minimum and working their way up as they become more financially stable. A perfect storm has been developing for many years now. Neoliberal ideology has resulted in the suppression of wage growth with governments acting in the interests of employers and the financial services industry which has pushed debt on to people. Privatisations have reduced the power and coverage of employees by unions.High immigration,encouraged by business (more customers) has also been part of that process. Unemployment and under employment serves employers as employees can be threatened with joining the ranks of the unemployed if they have the temerity to demand they be paid fairly for their productivity. The profit share of national income is now at record highs. All this is exacerbated by high property price growth and rent rises plus high utility and child care costs. On top of all that the use of interest rates as the only lever to regulate demand in the economy is, frankly, stupid. The the federal government is not spending enough to stimulate demand which will help to ease the developing storm. But the current government is if anything doubling down, not spending enough and as John says, is focused on tax cuts for business as their only answer. It should be balancing the economy instead of balancing the budget as well as levelling the industrial playing field. It took my husband and I (with ordinary office jobs) 18 months to save the deposit for our first house – at Beacon Hill, near Frenches Forest, in Sydney, in 1970. Purchase price $14,500. We needed $1,450 deposit. The house is now valued at $1,500,000. Looks exactly the same. 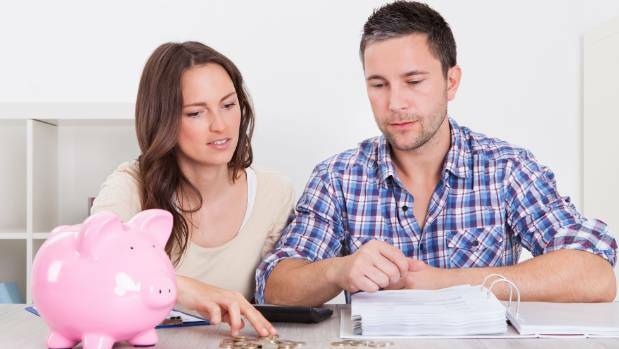 Imagine how long it would take a young couple in similar jobs (if they could find stable employment at all) Even if a bank would let you buy a house on only 10% deposit, it would take a lot longer to save up $150,000. and then you would have a mega mortgage to service for the rest of your life.